In the Boiler Efficiency lab, we stated that Combustion Efficiency is defined as the ratio of the burner’s capability to burn fuel completely to the unburned fuel and excess air in the exhaust. In this lab, we will perform a combustion analysis. Fossil fuels may be classified into solid, liquid and gaseous fuels. The vast majority of fuels are based on carbon (C), hydrogen (H2) or some combination of carbon and hydrogen called hydrocarbons. Considering that combustion occurs in air rather than in pure oxygen, the nitrogen in the air may react in the combustion process to produce nitrogen oxides. Beside, some fuels contain elements other than carbon, and these elements may react with oxygen during combustion. Also, combustion is not always complete, and the exhaust gases contain unburned and partially burned products in addition to C02 and H2O. Flue gas compositions are presented in terms of mole fractions as kmol of product per kmol of fuel. Determine the stoichiometric air/ fuel mass ratio and product gas composition for combustion of octane ( C8H18) in air. Other components and impurities in the fuel make the calculation process more complicated. For example if sulfur exists in fuel it is usually combust into sulfur dioxide (SO2). Ash, the noncombustible inorganic (mineral) impurities in the fuel, undergoes a number of transformations at combustion temperatures, will be neglected in the further calculation (ash will be assumed to be inert). For most solid and liquid fuels, the chemical composition is on a mass basis, as determined in the ultimate analysis. The combustion reactions are written following the stoichiometric rules as defined above. The quantity of matter entering into a reaction is equal to the quantity of matter in the products of the reaction. Total mass of combustion products: Determine the mass of each combustion product. For example, given C content of 84.9%, CO2=84.9/100*3⅔=3.11% and find the total mass of combustion products. Analysis of combustion products by mass: Suppose the total mass of combustion products in step 3 has been found as 12.09 kg/kg fuel, then CO2=3.11/12.09*100=25.74. This means that 25.74% of the flue gas is CO2. Repeat this calculation for each constituent. 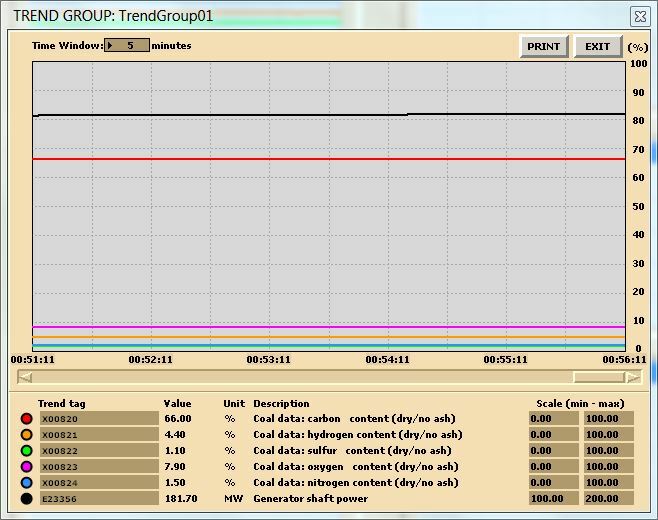 Burning default coal: After 10 minutes of running the simulator, freeze simulator and print the two trends. This is the reference point for the next step. Burning poor quality coal: Switch to run mode and access Variable List page 0111 on MD180. Set the new values as shown below. After 10 minutes, freeze simulator and print the two trends. Computation: As per lab instructions above, perform combustion analyses using MATLAB or MS Excel. Basic Engineering Thermodynamics in SI Units by R. Joel: Combustion. Thermal Engineering by H.L. Solberg, O.C. Cromer and A.R. Spalding: Fossil fuels and their combustion. Combustion Analysis by Serhat Beyenir & Sanja Boskovic is licensed under a Creative Commons Attribution 4.0 International License, except where otherwise noted.